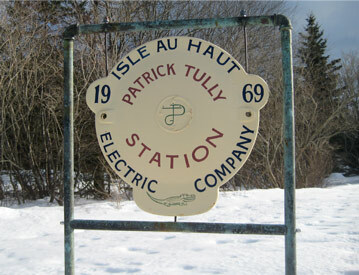 Prior to the Power Company’s inception in 1969, homes on the island were run with privately-owned diesel generators, as power was needed. Electricity now arrives via submarine cable. While the electricity rates are somewhat higher than on the mainland, islanders enjoy the advantage of the company’s back-up generators. During outages, the lights may stay out on Stonington, but Isle au Haut’s generators normally rev up and island electricity is running again in under 20 minutes. Recently, there have been successful forays into solar power, with which the IAH Electric Power Company has been an indispensable partner.